Updated for Vault 2012: New image types are now supported for thumbnails. In Vault 2011 and earlier, Metafile was the only image type. In Vault 2012, anything that can be streamed into System.Drawing.Image is supported. This post contains the updated code. The old code can be found here. Basically there are two possible algorithms, and you don't know which one to use upfront. So the code tries one algorithm. If it fails, the second algorithm is run. Update: The 2013 version is available. Here is the new version of Project Thunderdome. It's mostly the same app as before, but now updated to work with Vault 2012. It still pulls down updates. It still has the "Users Folder" concept. And you can still backup your settings. There are some minor fixes. For example, if an extension gets installed, a menu reset is performed. If you have a Web Service event handler, Project Thunderdome can pull that down too. Vault 2012 has the concept of an Extension, which encompasses both custom commands and web service command event handlers. Thunderdome will pull down an extension, regardless of type. UPDATE: The tool has been updated to fix an issue where settings files were being set as read-only. The links above are to version, 2.0.2.0, which has the fix. The settings are different from Vault 2011 and Vault 2012. 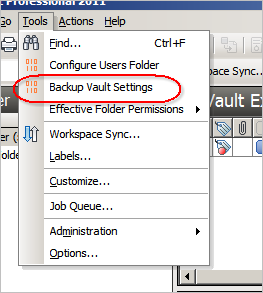 So if you are pushing out settings and extensions, make sure they are synced to Vault 2012. Likewise if you have saved settings, you will might want to clear those out and re-save with your Vault 2012 settings. Here is how you can solve the "Four Eyes" problem with the new events feature in the API. First, I should define the Four Eyes so we are all on the same page. Anyone on the Engineering group can change the lifecycle state of a file from "Work In Progress" to "For Review". Any engineer can also change the lifecycle state from "For Review" to "Released". However, you don't want the same person to do both these transitions for a given file. 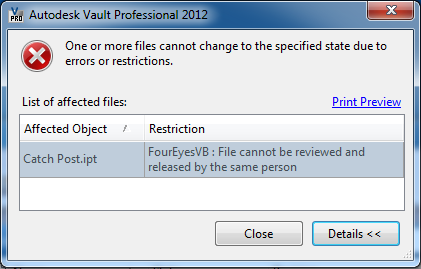 In other words, you want "four eyes" to see the file before it gets released. Using the default Vault features, you can't solve the problem. But with events, you can. By hooking to the UpdateFileLifecycleStateEvents event, you can check the file history and add a restriction if you detect only "two eyes" on the file. I was going to just paste the code in-line with this post, but it turned out to be more code than I expected. This is one of those things that the human brain has no problem with, but it takes a huge amount of work to put it into computer terms. I can't complain though since that's how I stay employed. Aside from the large amount of code, there are a few other ugly, yet unavoidable, aspects to this solution. Redundant API calls - It would be nice to save off the reviewState and releaseState LfCycDef objects once we look them up. We can't do that because we can't assume we are communicating with the same server or vault between events. So, we are forced to look up the LfCycDef objects each time. Requires consecutive versions - There is no easy way to pinpoint which version is the one with the lifecycle state change. We are forced to order all the versions and cycle through the set. We compare version N with version N-1 and see if the lifecycle state is different. If a purge creates gaps in the version history, it may be impossible to figure out who changed the state on the file. File.FileLfCyc.LfCycStateId and File.FileLfCyc.LfCycStateName - This one tricks me every time I run into it. The LfCycStateId has the lifecycle state ID of the latest file in the revision. The LfCycStateName has the lifecycle state name of the current file version. That's why the code compares state name instead of the ID. Update: There is a great video explaining the end-user experience of this feature. Contine reading for the technical details that make this feature possible. File Associations have gone through some changes for Vault 2012. Most of the changes are around a new feature which I will refer to as File Resolution. Basically, the feature is about fixing up broken file references if a file is moved or renamed. To enable this feature, we needed to add extra meta-data to file associations. This meta-data is used to A) detect when a reference is broken and B) provide information necessary to fix the reference. The first change you will notice is that AddFile and CheckinFile methods are different. Instead of passing in 4 parameters (dependFileIds, dependSources, attachFileIds, attachSources) related to file associations, there is now only 1 parameter (associations). The association parameter is an array of FileAssocParam objects. The FileAssocParam class contains the child file ID, the source meta data and the association type (attachment or dependency). So it contains all the information from before, just in a different form. The new pieces of information are the RefId and the ExpectedVaultPath properties. RefId is metadata indicating how to locate the reference within the parent file. This data is file-type specific and is not something you want to set yourself. The CAD plug-in will set this up when files are added in. If you are doing an update, you need to re-specify the associations at check in, so just pass in the RefIds from the associations on the previous version. ExpectedVaultPath is the vault location of the child file. This piece is used to detect when moves or renames happen. The word expected is there because you can never be 100% sure of that location. Because Vault is a multi-user environment, it's possible that someone else renamed that child right before you do yout check-in. The system is architected so that you don't need to know the exact path at the moment of check-in. You just need to know the path that the parent is expecting the child to be in. The File Resolve framework will do the rest. If you are reading file associations on existing file, there some new parameters on FileAssoc. The ExpectedVaultPath shows up here. There is also a new property called VaultPathChanged. This property is a boolean that indicates that broken reference has been found. If the current Vault path is not equal to the expected Vault path for either the parent or the child, the value will be TRUE. When broken references are detected, components called Resolvers are in charge of fixing up the references. Resolvers run client-side and are file-type specific. Currently we only have resolvers for AutoCAD, Inventor and Navisworks files. All other files cannot participate in the file resolution feature. A Resolver is not something you should be dealing with directly. The new utility Autodesk.Connectivity.Explorer.ExtensibilityTools.IExplorerUtil contains DownloadFile() functions that will do the download and run the Resolver. However, the older function Autodesk.Connectivity.WebServices.DocumentService.DownloadFile() will not run the resolver. The reason is that the WebServices DLL is about server communication, not client-side operations. If you used checksum in the past to locate files, that's no longer a good mechanism. Because the files are modified client-side, the checksum will no longer match the Vault checksum. So you need to use things like filename, path, and last modified date to match between local and Vault files. If you feel you absolutely need checksum capability, let me know and I will find you a workaround. The File Resolution feature is a difficult one to consume from an API standpoint, but the end user experience is a very positive one. In earlier versions of vault it was very difficult for a user to move and rename files, especially if a file was used in many places. Under the new model, files can be easily and quickly moved and renamed. I'm seeing a lot of people having issues loading their Vault 2012 extension, so here is an updated deployment checklist. The 2011 version of the checklist is here. Is your project using .NET 3.5 or earlier? Are you using Vault Workgroup, Collaboration or Professional? 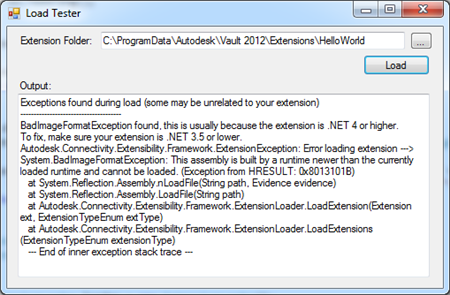 Did you deploy to %ProgramData%\Autodesk\Vault 2012\Extensions\[myExtension]? Did you include a .vcet.config file? Does the .vcet.config file have the correct Assembly name? Does the .vcet.config file have the correct Extension Type? Does your extension have values set for AssemblyCompany, AssemblyProduct, AssemblyDescription, ApiVersion and ExtensionId assembly attributes? Do you have "4.0" as the attribute value for ApiVersion? Does your IExtension, IJobHandler or IWebServiceExtension implementation have a public default constructor? 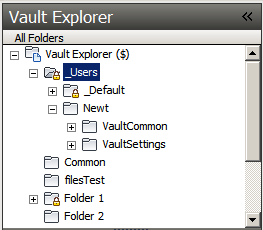 Did you reset your menus in Vault Explorer? Do your CommandSite objects have non-empty Label values? If you are still having trouble, I wrote a test loader that you can use. It will display more detailed information about why you extension is not loading. The compiled EXE is in the bin\Release folder. The source code is provided too. It makes use of some loader utilities in Autodesk.Connectivity.Extensibility.Framework.